White water & surf Spraydecks for sale from our canoe shop or by mail order throughout the UK. 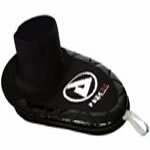 Made in the UK the Manic Shock deck is a simple shockcord spraydeck ideal for first timers, suitable for white water and surf. 4mm durable, multistretch neoprene deck section and body tube. Made in the UK the Manic River is the perfect allround whitewater deck, simple, yet carefully designed a seamless deck area from the highest quality neoprene with latex and shock cord for a dry seal. 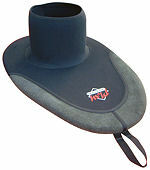 A tough neoprene spraydeck designed for demanding white water and surf use. Playboater Work Deck sets the standard for whitewater decks. Designed and used by Shaun Baker with Latex coating inside for grip and Kevlar reinforcing. Palm's Impact spraydeck will perform again and again in all conditions. Ideal for the white water paddler, the Palm Impact combines ArmorTex neoprene and reinforced seams to give you a truly tough spraydeck.